Even respected authors and historians sometimes succumb to the temptation to selectively use source materials, either in an attempt to denigrate the Catholic church (which, Lord knows, can do that for itself) or to boost sales. In short, any modern work that uses the diary of Stefano Infessura (http://en.wikipedia.org/wiki/Stefano_Infessura) as a source is suspect, whereas those which use the contemporary works of Johannes Burckardt (https://de.wikipedia.org/wiki/Johannes_Burkhardt) are considered more reliable. 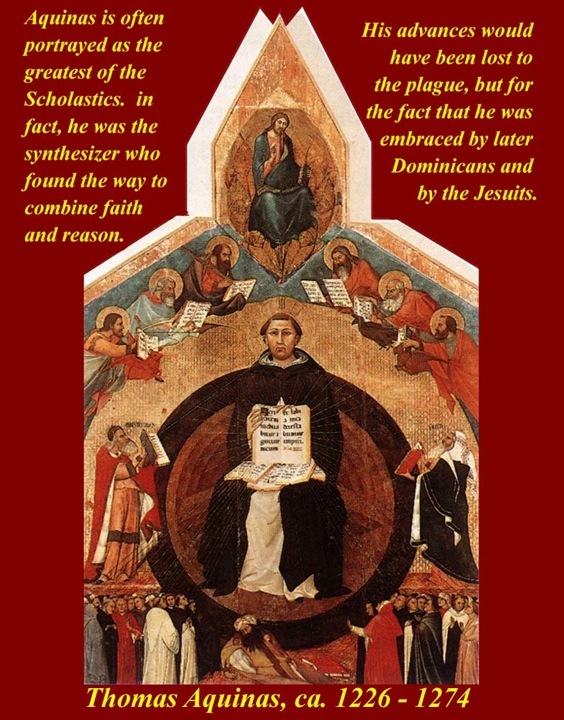 The Dominican Thomas Aquinas was either the last scholastic or the first humanist, depending on which source you wish to believe. See http://www.newadvent.org/cathen/14663b.htm and http://plato.stanford.edu/entries/aquinas/. The Epistolae Familiares and Epistolae Seniles of Petrarch (1304-1374) reflect the author's emphasis on concrete human experience and his love of classical antiquity attitudes which became characteristic of the revival of classical learning which he helped set in motion. By composing letters to ancient Greek and Roman personalities as if they were still alive, Petrarch hoped to revive the individuality, beauty, and purity which he perceived in the classical works. He felt that the lessons of the ancients could serve to invigorate the moral life of Christendom and to lighten a world beset by disease, famine, and other woes. A short article on Petrarch's "familiar" and "old age" letters is at http://en.wikipedia.org/wiki/Epistolae_familiares. Some of the letters are at http://petrarch.petersadlon.com/letters.html and http://petrarch.petersadlon.com/seniles.html and http://history.hanover.edu/texts/petrarch/pettable.html. Francis Petrarch has been labeled the "first modern man of letters" and the "founder of humanism." Probably best known for his creation of the sonnet form of poetry and for his love poems to Laura, he was also a prolific scholar and writer. 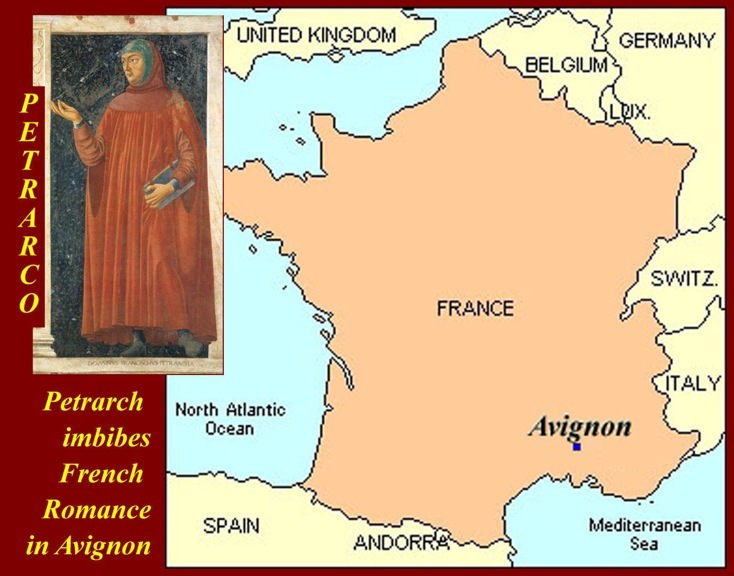 He wrote theological and philosophical treatises, epic poems, and polemical works directed against those whom, he believed, had corrupted learning and religion in Christendom. He also played a leading role in rehabilitating the literary genre of the epistle, a letter addressed to a private individual but intended for a public audience. Most of Petrarch's letters are addressed to living human beings, but he did write several addressed to authors of the ancient world. Petrarch was highly critical of the learning of his own age. He criticized scholasticism, the dominant method of learning in the "schools" or universities, as arid and useless, focusing too much on hair-spitting logic and on abstract and abstruse subjects. Petrarch instead looked the ancients for guidance, and especially to Cicero. Marcus Tullius Cicero (104-43 B.C.E.) appealed to Petrarch and to subsequent humanists because his writings provided (in elegant Latin) an overview of all of Greek and Roman learning and specifically because Cicero was a prophet of a humanities-based liberal arts education favored by the humanists (and articulated by Vergerius in the next section). Petrarch wrote the following letter to Cicero after he had discovered a hitherto unknown cache of Cicero's letters. The letters reveal Cicero to be a man deeply involved in the Roman politics in the last years of the Republic, a partisan on the side of Republican liberty against the side of monarchy, or empire. Before reading the letters, Petrarch had imagined Cicero in his later years to be a sage philosopher, retired from public life and far removed from the world of politics. 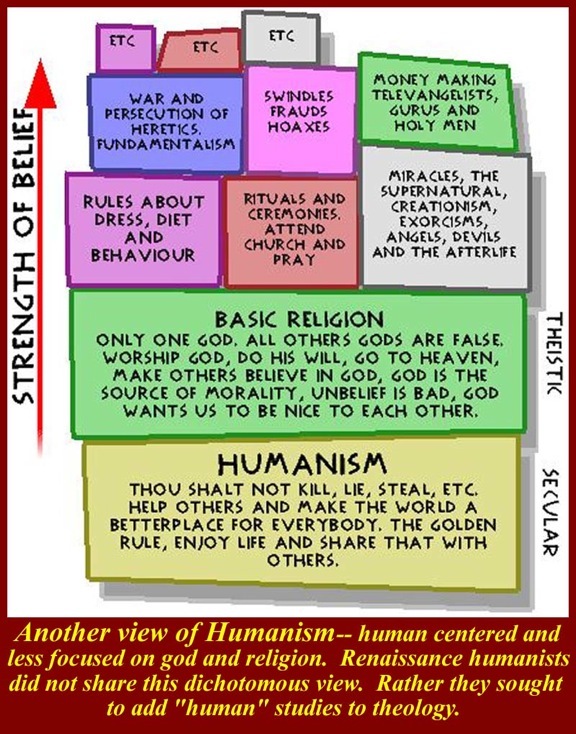 A hypothetical flow chart of factors shaping change toward Humanism and a graphic illustrating some differences between Humanism and Theism. 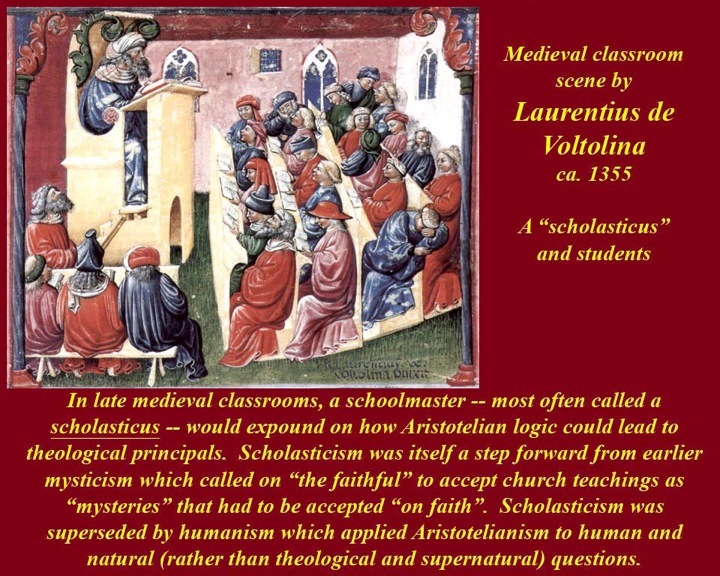 In medieval university classrooms, the "scholasticus" would expound and the students would listen. Debate rarely followed, at least in the classroom setting. 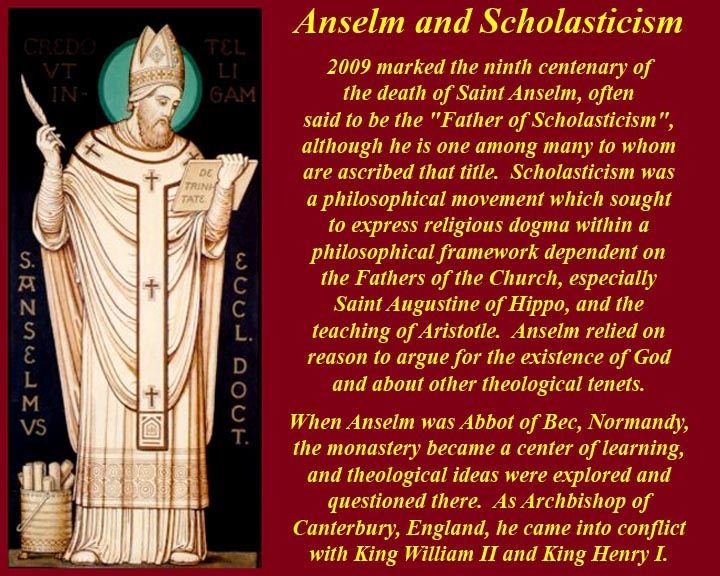 Anselm was one of the great proponents of scholasticism and one of several persons called "the father of Scholasticism". Anselm relied on "reason" (not mere faith or mysticism) to argue for the existence of god and to argue about other theological tenets. For more on Anselm, see http://maritain.nd.edu/jmc/etext/hop30.htm. 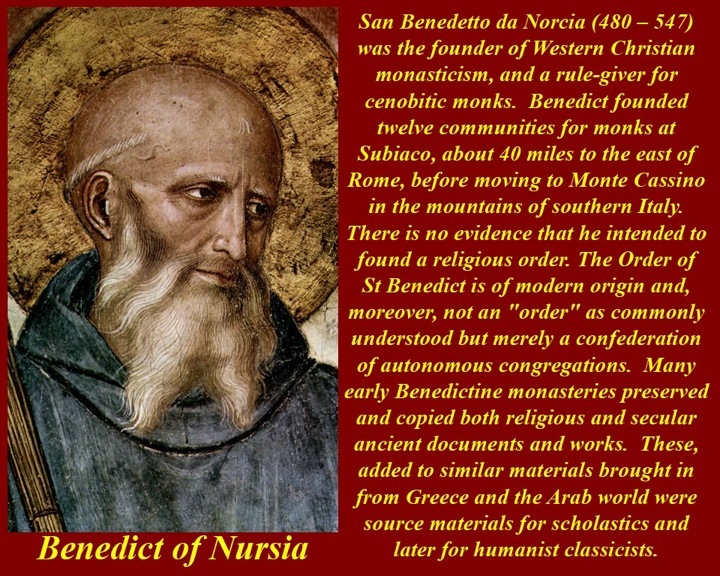 Benedict of Nursia founded twelve communities of monks at Nursia, 40 miles east of Rome before moving to Monte Casino in the mountains near Naples. His "Benedictine" monks lived by a specific "rule" which was of his composition (full English text at http://www.ccel.org/ccel/benedict/rule.titlepage.html?highlight=benedict,rule#highlight). 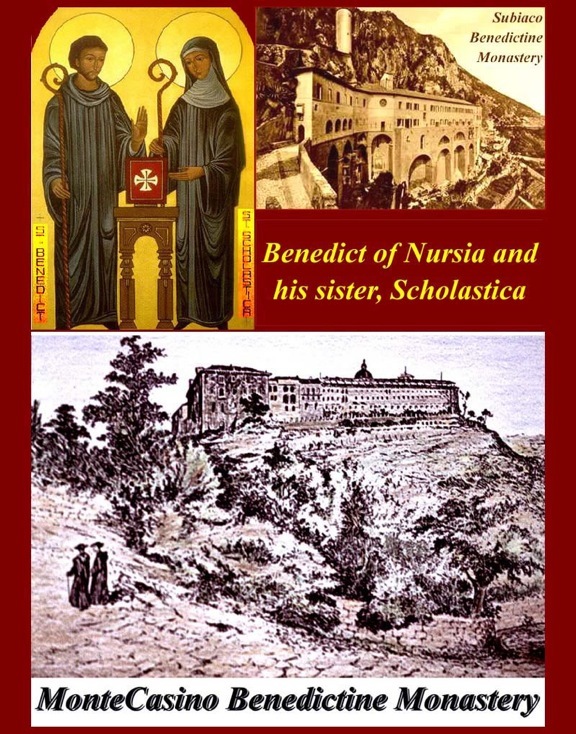 Benedict's "twin sister", Scholastica, may be merely an allegorical later addition, although her real existence is said to be based on a description based on words supposedly dictated to his Deacon by the Benedictine Pope, Gregory the Great (c. 540-604). Much about Benedict himself also is conjectural. What is certain is that "Benedictine" monasteries sprang up first in Italy and then elsewhere in Europe during Medieval times, and that the libraries of some of these monasteries, including the great library of Monte Casino, supplied some of the Patristic and classical texts that were essential for the development of "Latinity", "Ciceronianism", and Humanism. 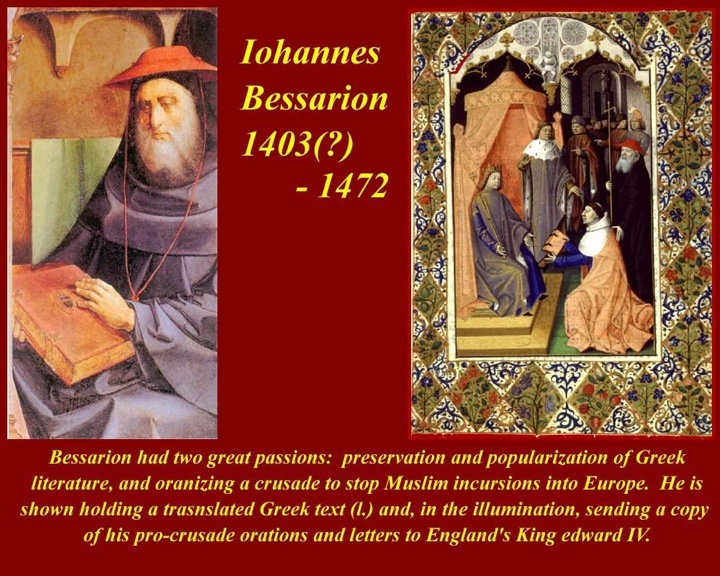 Iohannes Bessarion (1403(?) - 1472) exercised his passions -- classical Greek literature, crusade mongering, and rapprochement between the Greek and Roman Churches -- from a small house inside Rome's old San Sebastian Gate on the Old Appian Way (Via Appia Antica). For information on the life and works of Bessarion, see http://www.newadvent.org/cathen/02527b.htm and http://en.wikipedia.org/wiki/Basilios_Bessarion. Bessarion's personal collection of classical Greek works, some of which he translated into Latin, provided the Greek input to humanistic studies of classical literature and life. Bessarion's collection of 750 codices in Latin and Greek, to which he added another 250 manuscripts and some printed books (incunabula), became the nucleus of the first "public" library open to scholars, the Biblioteca Nazionale Marciana (= National Library of St Mark's) in Venice. The Marciana is one of the earliest surviving public manuscript depositories in the Italy, holding one of the greatest classical texts collections in the world. 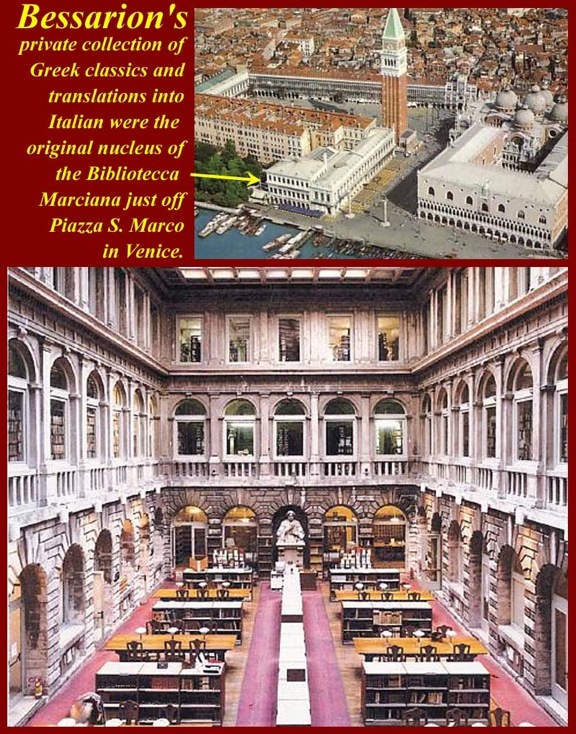 The library is named after St. Mark and sits at the corner of Piazza San Marco opposite the Doge's Palace. Information is at http://en.wikipedia.org/wiki/Biblioteca_Marciana. 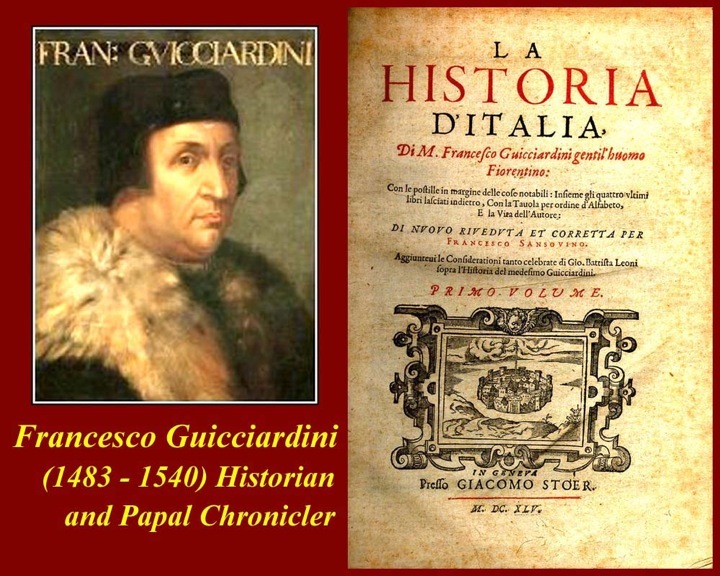 Francesco Guicciardini (March 6, 1483 - May 22, 1540) was an Italian historian and statesman. He is considered one of the major political writers of the Italian Renaissance. Guicciardini is considered as the Father of Modern History, due to his use of government documents to verify his "History of Italy." Read about Guicciardini at http://en.wikipedia.org/wiki/Francesco_Guicciardini and read an English translation of his History at https://openlibrary.org/books/OL6931379M/The_history_of_Italy. 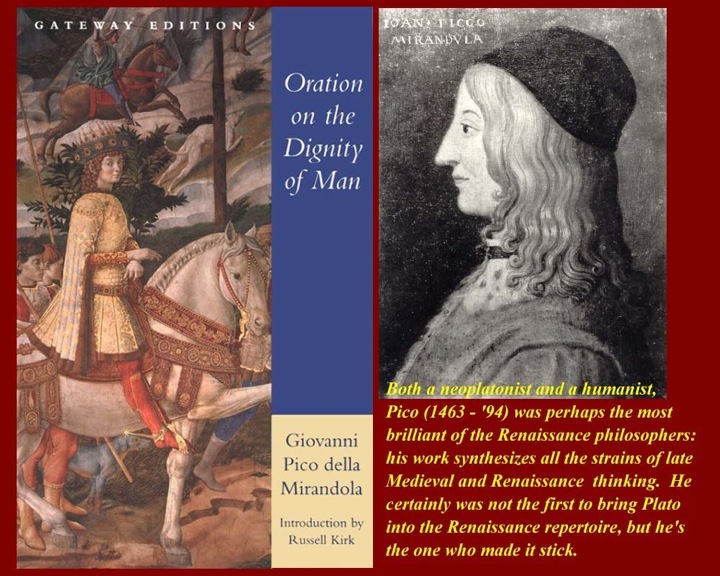 Giovanni Pico della Mirandola -- If there is such a thing as a "manifesto" of the Italian Renaissance, Giovanni Pico della Mirandola's "Oration on the Dignity of Man" is it. No other work more forcefully, eloquently, or thoroughly remaps the human landscape to center all attention on human capacity and the human perspective. 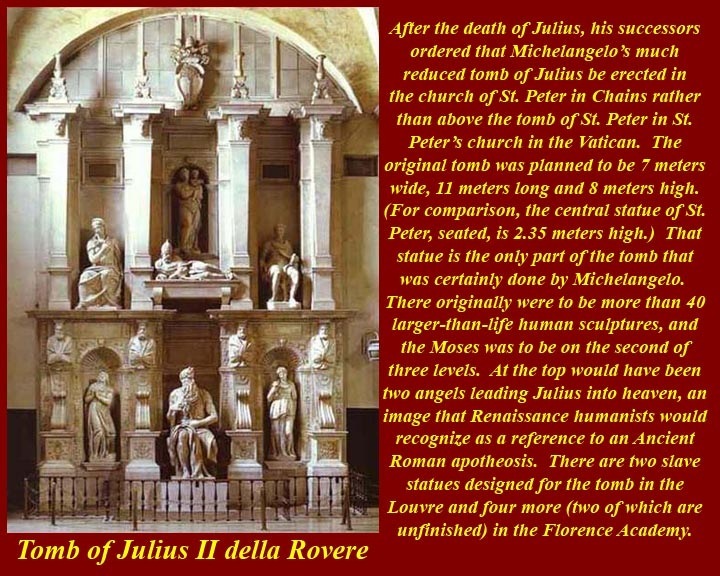 Pico himself had a massive intellect and literally studied everything there was to be studied in the university curriculum of the Renaissance; the "Oration" in part is meant to be a preface to a massive compendium of all the intellectual achievements of humanity, a compendium that never appeared because of Pico's early death. For more on Pico and his oration, see https://plato.stanford.edu/entries/pico-della-mirandola/ and http://www.newadvent.org/cathen/10352a.htm and see http://bactra.org/Mirandola/ for the entire Oration in English translation. 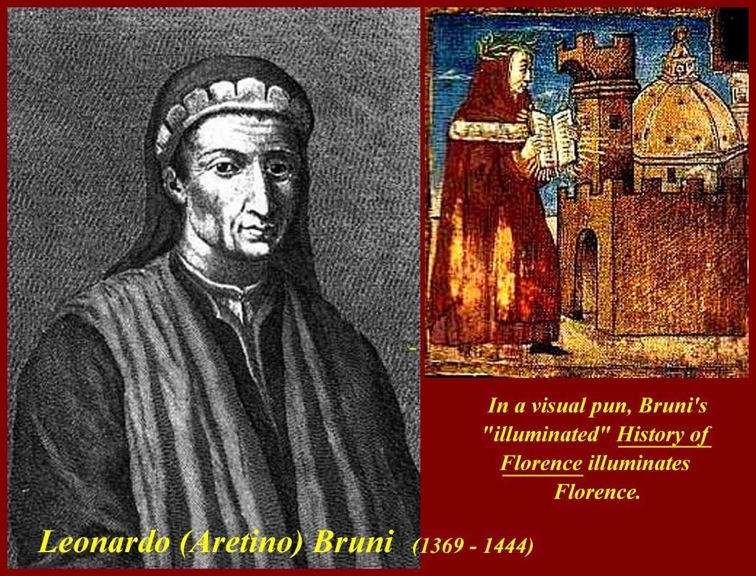 Leonardo Bruni's most notable work is History of the Florentine People, which has been called the first modern history book. Bruni was the first historian to write about the three period view of history: Antiquity, Middle Age, and Modern, a concept from which the term Middle Age was coined by a contemporary Flavio Biondo. The dates Bruni used to define the periods are not exactly what modern historians use today, but he laid the conceptual groundwork for a tripartite division of history. While it probably was not Bruni's intention to secularize history, the three period view of history is unquestionably secular, and, for that reason, Bruni has been called the first modern historian. The foundation of Bruni's conception can be found with Petrarch who had first written, a generation earlier, about a "Dark Age" covering the period from the time of the fall of Rome extending to the time of Petrarch. 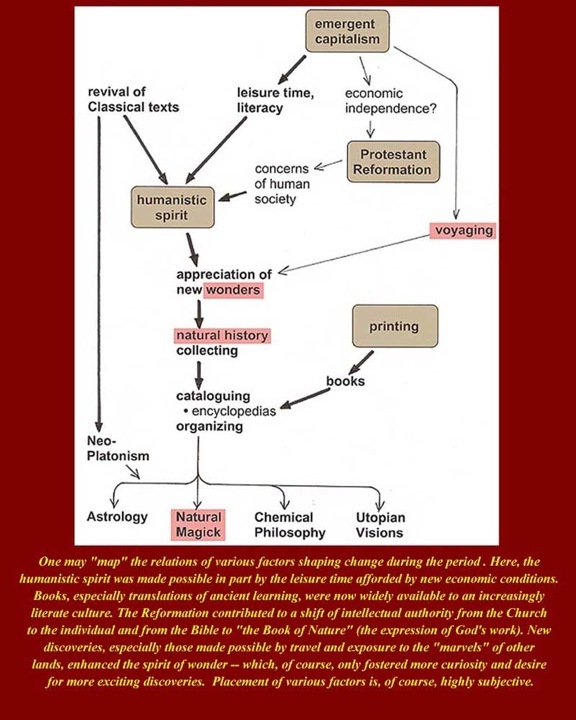 Bruni and his fellow humanists believed they had reached the end of the Dark Age and were entering a modern period and thus logically called the intervening period a Middle Age. 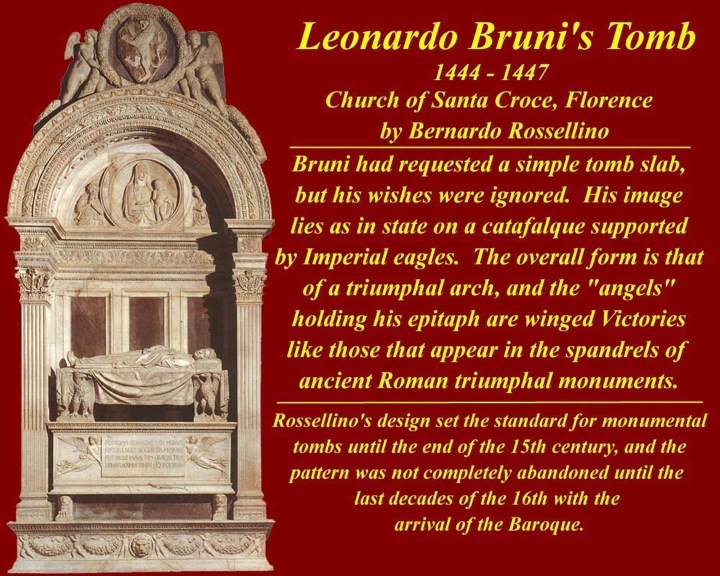 See http://en.wikipedia.org/wiki/Leonardo_Bruni for more on Bruni. Lorenzo Valla (c. 1406–1457) was one of the most important humanists of his time. Valla did not have an easy life. Equipped with a sharp and polemical mind, an even sharper pen and a sense of self-importance verging on the pathological, he made many enemies throughout his life. In his Elegantiae linguae Latinae, an advanced handbook of Latin language and style, he gave the humanist program some of its most trenchant and combative formulations, bringing the study of Latin to an unprecedented level. He made numerous contributions to classical scholarship. But he also used his vast knowledge of the classical languages and their literatures as a tool to criticize a wide range of ideas, theories, and established practices. He famously exposed the Donation of Constantine—an important document supposedly justifying the papacy's claims to temporal rule—as a forgery. He compared, for the first time, St. Jerome's Latin translation of the Bible (the Vulgate) with the Greek text of the New Testament and pointed out both Jerome's translation errors and Jerome's incorrect Latin usages, thereby laying the foundations of critical biblical scholarship. In his Repastinatio dialectice et philosophie (Re-ploughing of Dialectic and Philosophy), also known as his Dialectics, he attacked scholastic-Aristotelian thought from an essentially linguistic point of view. Some of Valla's most important (and anti-Papal) work was done in Naples, but his skill and intellect was so well recognized by the Papal Court that he was later employed as a Papal Secretary and, when he died, he was honored with a lavish funeral and burial in the St. John Lateran Basilica. Already highly controversial in his own times, Valla's works continue to provoke heated debate in modern times. For more on Valla, see http://plato.stanford.edu/entries/lorenzo-valla/. 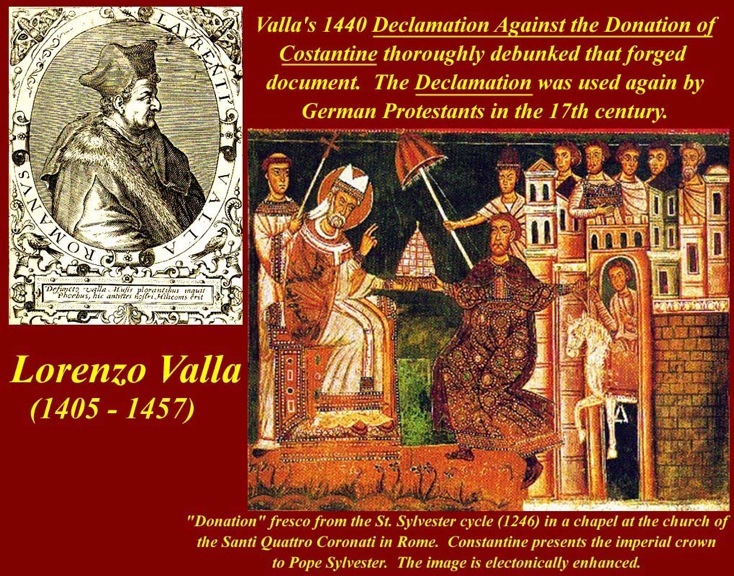 Valla's debunking of the Donation of Constantine is available in Latin and English here. Scroll down for alternate pages in the two languages. 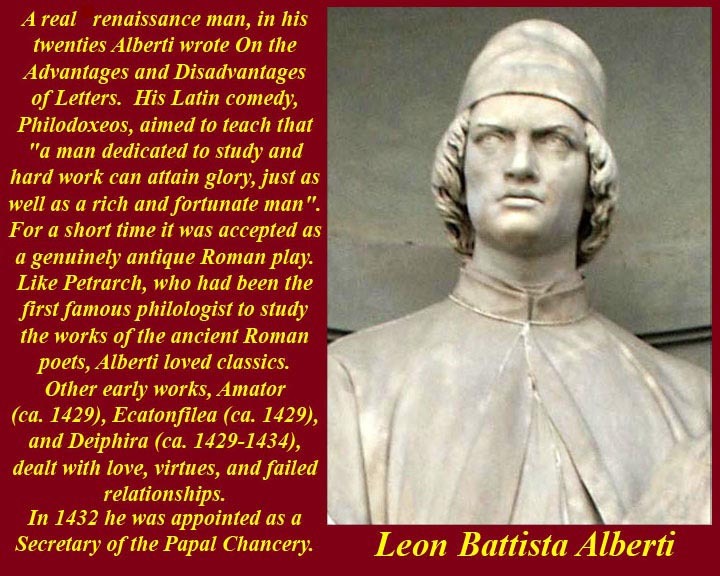 Leon Battista Alberti (born Feb. 14, 1404, Genoa - died April 25, 1472, Rome) was an Italian architect and humanist author. In his personality, works, and breadth of learning, he is considered the prototype of the Renaissance "universal man". 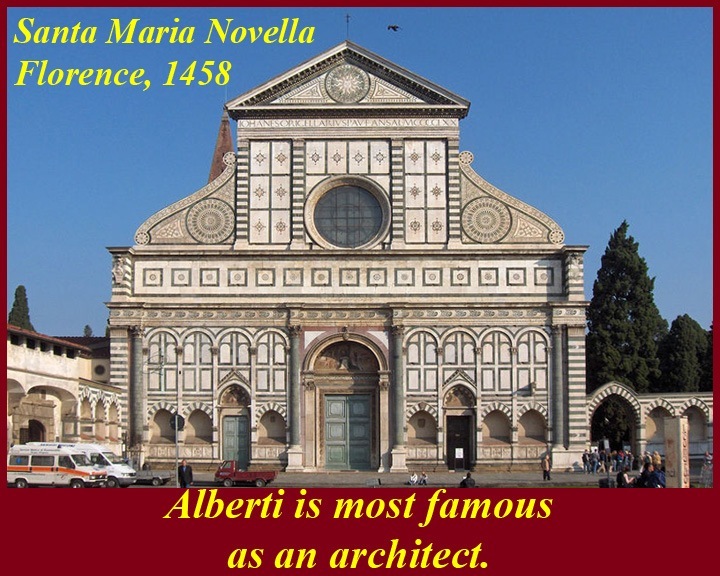 The first theorist of Humanist art, Alberti belonged to an important Florentine family that had been exiled from Florence since 1387. When the family returned to the city in 1429, Alberti gained access to the city's great architecture and art which he studied extensively. 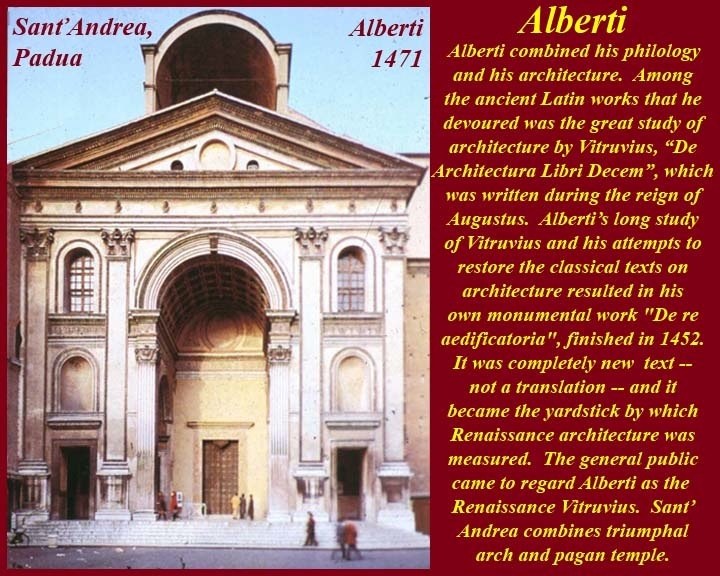 Well-versed in Latin and Greek, Alberti never received a formal architectural education. His architectural ideas were the product of his own studies and research. Alberti's two main architectural writings are "De Pictura" (1435), in which he emphatically declares the importance of painting as a base for architecture and "De Re Aedificatoria" (1450) his theoretical masterpiece. Like Vitruvius's "Ten Books on Architecture", "De Re Aedificatoria" was subdivided into ten books. Unlike Vitruvius's book, Alberti's told architects how buildings should be built, not how they were built. "De Re Aedificatoria" remained the classic treatise on architecture from the sixteenth century until the eighteenth century. The unfinished Tempio Malatestiano in Rimini (1450) was the first building that Alberti designed and attempted to build based on his architectural principals. Up to that point Alberti's architectural experience was purely theoretic. The facade of Santa Maria Novella (1458-71) is considered his greatest achievement since it allows the pre-existing and newly added parts of the building to merge into a clear statement of his new principles. "The terms Renaissance Man and, less commonly, homo universalis (Latin for "universal man" ) are related and used to describe a person who is well educated or who excels in a wide variety of subjects or fields. The idea developed in Renaissance Italy from the notion expressed by one of its most accomplished representatives, Leon Battista Alberti (1404–72): that “a man can do all things if he will.” It embodied the basic tenets of Renaissance humanism which considered humans empowered, limitless in their capacities for development, and led to the notion that people should embrace all knowledge and develop their capacities as fully as possible. 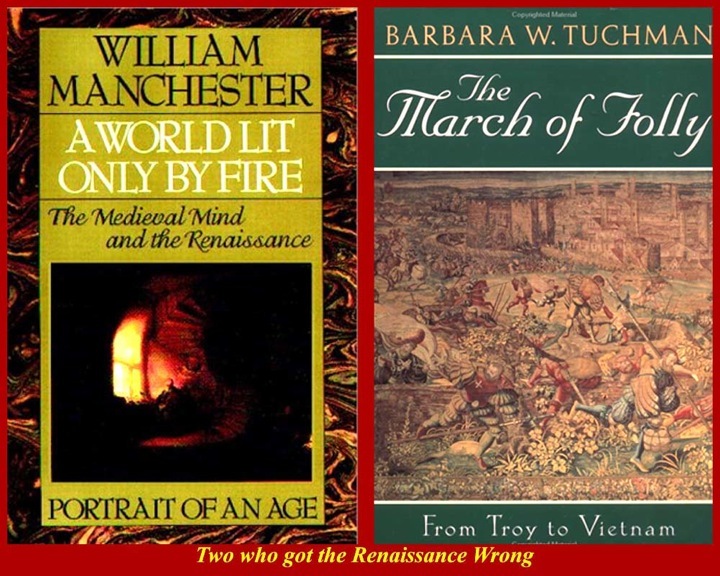 Thus the gifted humans of the Renaissance sought to develop skills in all areas of knowledge, in physical development, in social accomplishments and in the arts." -- the quote is used on so many Internet sites that its origin is not determinable. 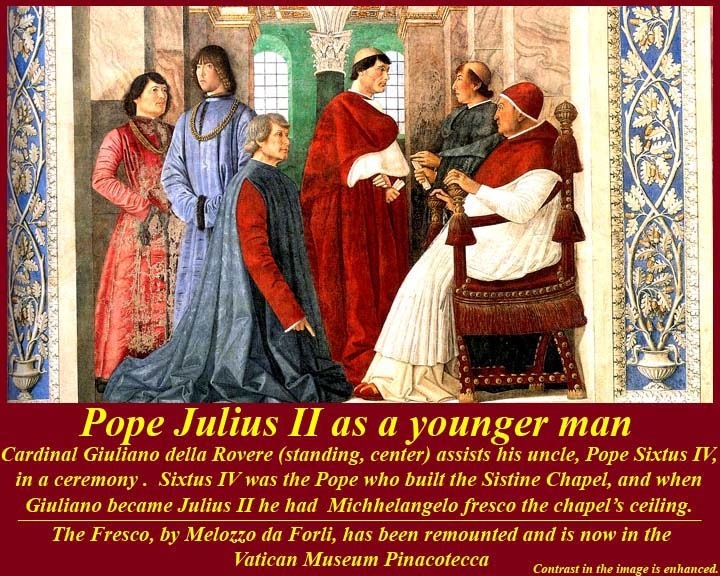 Although humanists had thronged the papal court since the beginning of the century, Pius II was the first real humanist to sit in the chair of Peter. Born in Siena as Enea Silvio Piccolomini, he acquired a reputation as a diplomat, belletrist, and womanizer, and was crowned poet laureate by the Emperor Frederick in 1442. 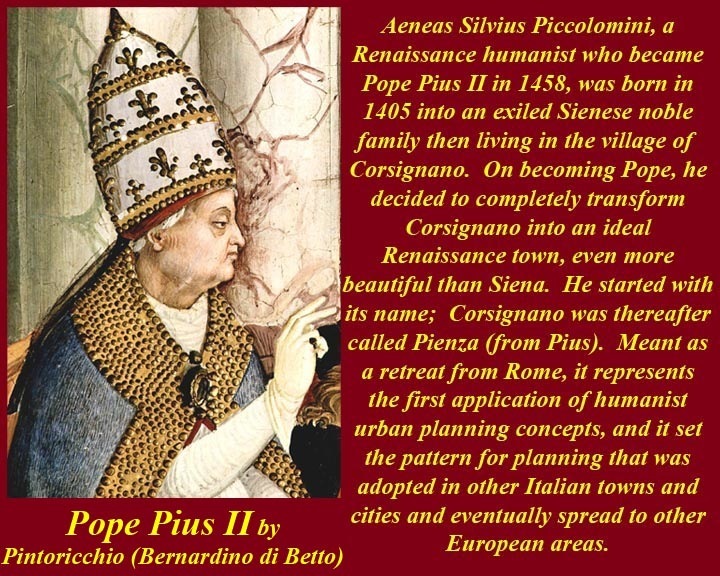 Aeneas Silvius Piccolomini (1405–64), Pope Pius II from 1458 until his death, was a patron of letters and author of a romance in Latin, Eurialus and Lucretia, of treatises on many subjects, and of commentaries on his times. His secular works include the Miseriae Curialium, which are decidedly secular moral and satirical stories. In his wild younger days he had fathered two illegitimate children (before taking holy orders), had been a partisan and official of the anti-pope Felix V (before shifting allegiance to Pope Eugene IV), and had been a diplomat, secretary, and poet laureate of Holy Roman Emperor Frederick III. He reputation as an inspired and learned humanist was recognized in the several courts in which he worked before his formal reconciliation between him and Pope Eugene IV, which took place in 1445. At about the same time, he apparently was morally regenerated and thereafter led an exemplary life. His experience in foreign courts (as far away as Scotland) meant that he was a useful and able Papal diplomat. After his election as Pope, he lived for a while in his birthplace, which he aggrandized and renamed Pienza (after himself) before returning to Rome to try to suppress internecine battles among the fractious Roman "noble" families. He devoted most of his papacy to trying to organize a crusade against the Turks, who had meanwhile taken Constantinople and were threatening points westward, but was unable to unify either the Italian or other European nobilities and monarchies behind the effort. Unlike some later popes (Medici and della Rovere) who were merely enthusiastic patrons of humanism and the arts Pius II had been a humanist in his own right. For more on Aeneas Silvius, see http://en.wikipedia.org/wiki/Aeneas_Silvius (which appears to duplicate the entry on Pius II in the old Catholic Encyclopedia). The most famous papal patron of humanism and the arts is, of course, Julius II della Rovere, who commissioned Bramante to start construction of the new St Peter's basilica, who put Michelangelo to work in the Sistine Chapel, and who kept Raphael and his studio employed decorating the walls of the Vatican Stanze (papal apartments) and logie (porticoes). 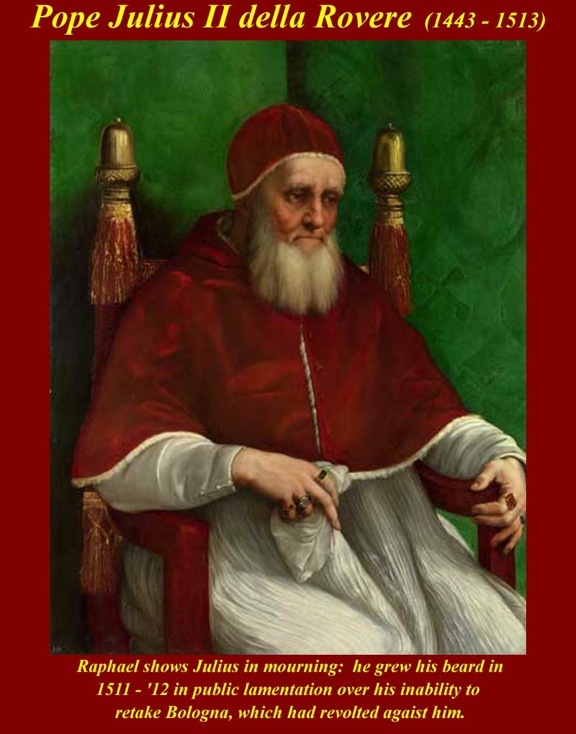 Pope Julius II, nicknamed "The Terrible Pope" (Il Papa Terribile -- i.e., the pope who inspires terror) and "The Warrior Pope" (Il Papa Guerriero), was born Giuliano della Rovere. He was Pope from 1503 to 1513. His reign was marked by an aggressive foreign policy, ambitious building projects, and patronage for the arts. A short biography is at http://www.luminarium.org/encyclopedia/julius2.htm. His projects are so well known that they need no discussion here; they will be taken up in later units. 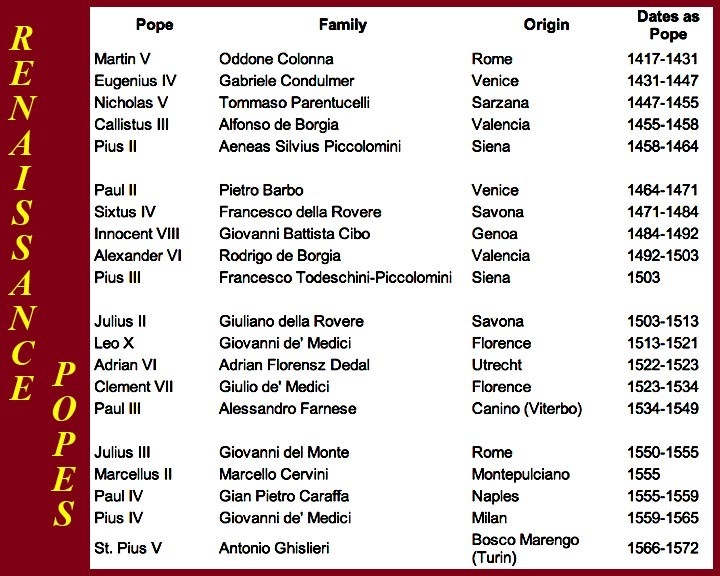 The list of Renaissance Popes. 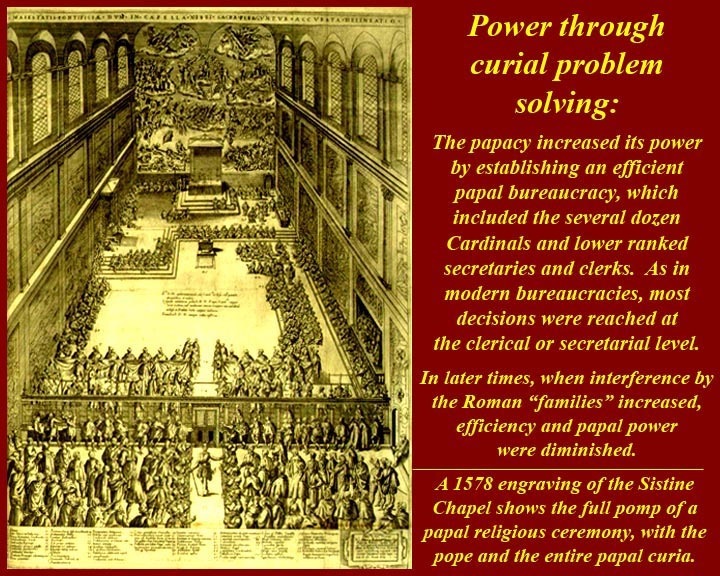 Some authorities say the Roman Renaissance began or ended sooner or later than the reigns of the listed popes, but their time period is about right. 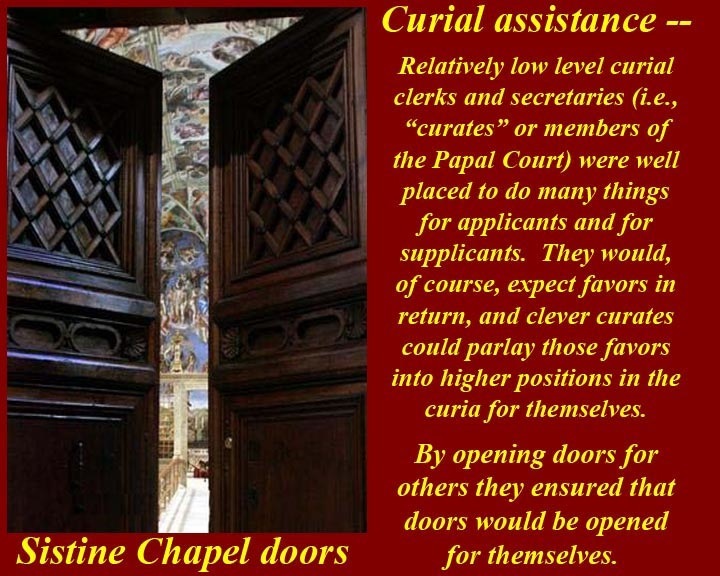 The Papal Curia is often identified as the College of Cardinals, but the Curia, in fact, includes not just the cardinals but also the entire papal bureaucracy; there have always been "disciples" as well as "apostles". 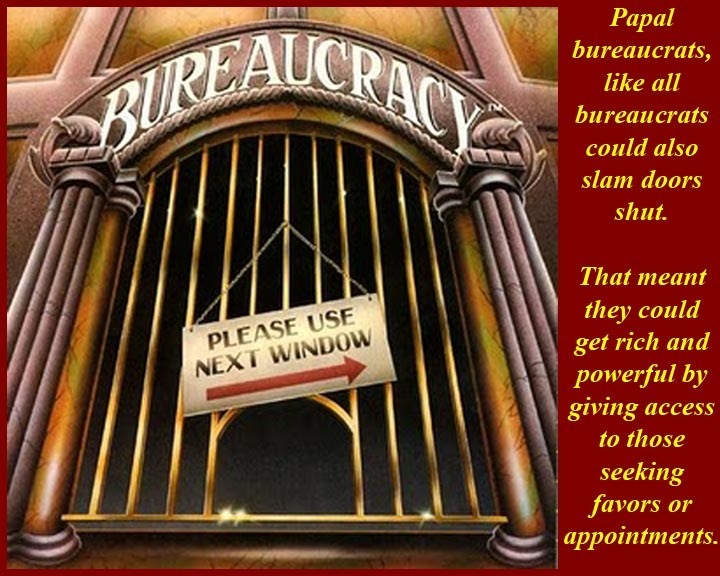 The bureaucrats, as always, wield the majority of the power. 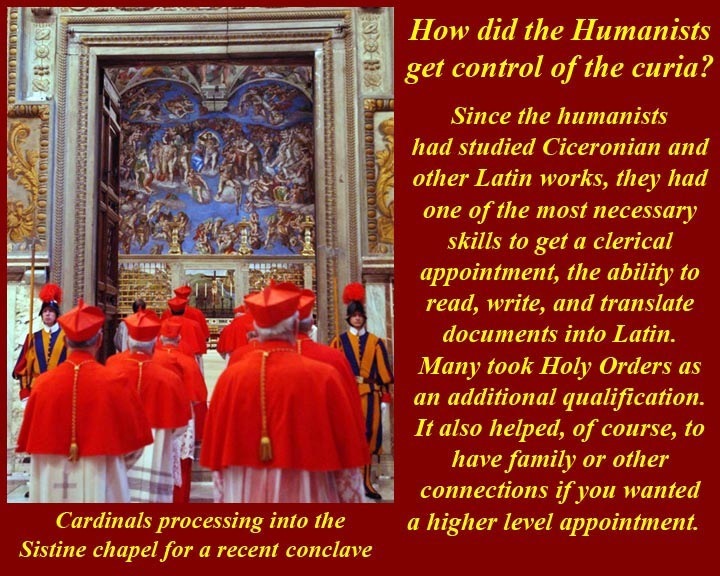 This was and is not because they have arrogated to themselves the powers of the "monarch" and the "princes" of the church, but rather it is the natural result of how decisions are made in any bureaucratic system. Very few things need the attention of the "principals", or, put the other way, almost all authority is delegated to underlings. 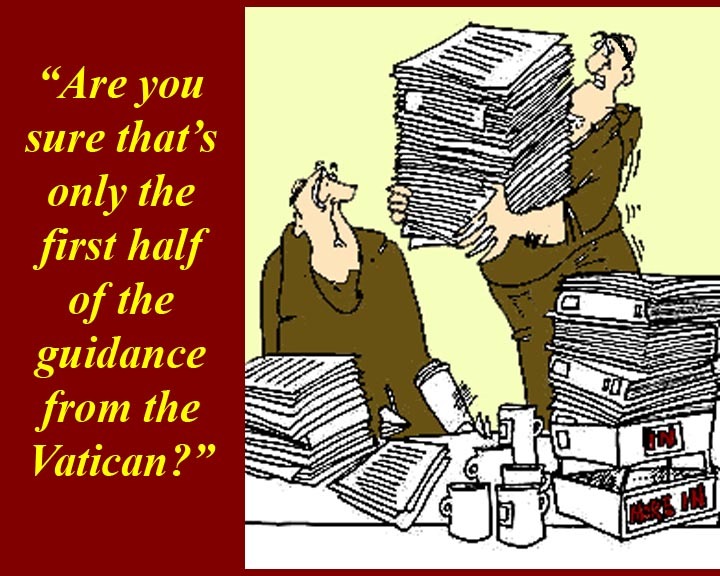 It is also the nature of bureaucracy that underlings and principals might be approached privately on a quid pro quo basis and that some may succumb to the temptation. Often the favor granted is merely access to someone higher up the line, and this and other favors are reciprocated. Clever bureaucrats, papal or otherwise, game the system for their own advancement or for what they regard as "higher ideals". This has always been considered to be inevitable -- part of the bureaucratic game. 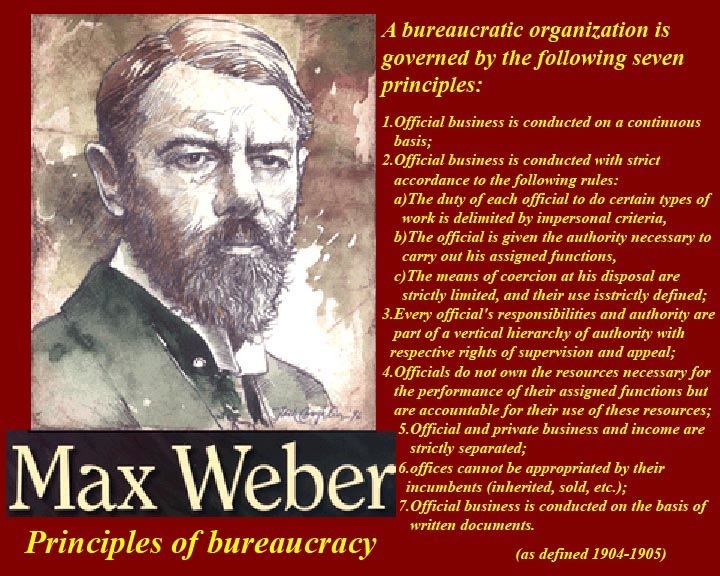 Never mind that is contradicts some of Max Weber's principles of bureaucracy.